Destiny beat out favourites Alien: Isolation and Middle-Earth: Shadow of Mordor at this year's BAFTA awards. 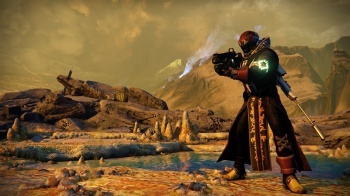 At this year's British Academy of Film and Television Arts awards, Bungie's MMOFPS Destiny took home the coveted "Game of The Year" award... despite not winning any of the other categories it was nominated in. The move shocked and confused the audience, who were expecting favorites such as Alien: Isolation and Middle-Earth: Shadow of Mordor to take home the grand prize. "There was an audible ripple of surprise in the press room as Destiny took the best game BAFTA," wrote BBC's Adam Rosser. Accepting the award, Bungie's president Harold Ryan thanked the game's playerbase for its continued support. "It's always a labor of love that we do because of the passion of the fans," he said. "They really are the ones who drive you to put the energy and time into putting the game together."